A senior Somali military commander was killed in a powerful roadside explosion near the capital, Mogadishu, Tuesday just two months after his several other senior officers were killed in the same area by an improvised explosive device (IED), military officials confirmed to VOA Somalia. The death of the two officers came exactly two months after two senior military commanders including Aden’s predecessor were killed by IED in the same vicinity. The explosion on Dec. 6 killed the commander of the 12th April Division, General Omar Aden Dhabad “Omar Dhere,” and his deputy general, Abdi Ali Jamame. 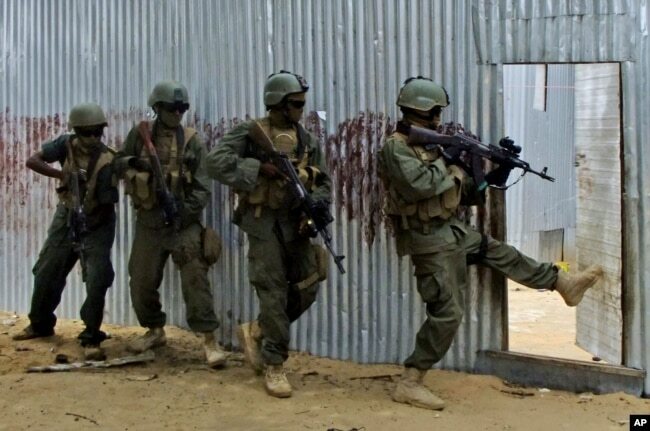 FILE - Somali soldiers search through homes for al-Shabab fighters, during an operation in Ealsha Biyaha, Somalia, June, 2, 2012. “These precision airstrikes support Somali partners’ ongoing efforts to reduce al-Shabab safe havens, degrade the terrorists’ infrastructure, and destroy terrorist equipment,” said the statement by Africa Command.